I know a lot of people are in love with Barack Obama and are incredibly supportive of his bid for United States President. I respect that and I am, at the very least, quite proud of how much more involved the populace is in the voting process this 2008 election. While I could certainly dispense with the hatred, name-calling and “us vs. them” attitude so commonly displayed nowadays (on both sides of the political spectrum), I will side with over-agressive involvement rather than passive apathy almost every time. But these Obama supporters – are they really enamored with Obama himself, the candidate? Or is it just the idea of Obama, and the “hope and change” he promises? Basically, are they voting for Barack, or are they voting for a Blank? I equate Obama to a blank slate, and there are a few parallels I can provide. I invite your comments after reading the extended entry below. (btw, “optimistic” does not mean “misty-eyed” despite my failed attempts at etymological research). So let’s say you have a group of people disenfranchised at the current political scene. In their view, the economy is in shambles, they’re tired of the War in Iraq, the price of gas is causing their hands to shake when opening their wallet, and besides, it’s easier to comiserate when you have the facts. The price of gas *is* high, so that is fact to them. It takes no leap of faith to be negative about things they KNOW. Then a candidate comes around and there’s little-to-no information about him politically. Isn’t it easier to assume that candidate will be the one to fix your problems? Isn’t there the possibility of a subconscious ulterior motive to gain happiness by believing that it can – just – be – better? Seems to me that the feeling they’d get from this unabashed optimism would be like crack cocaine when compared to their general feelings about life, no matter how unfounded that optimism might be. They feel REALLY good about it, too. There aren’t any pesky facts to contradict this newly-found hope and trust. Anyone who dares bring up ANYTHING that might conflict with their dreams of the future, be it his unfortunate-timing middle name, ties to possible shady real estate deals, potential ties to racism reparations, his associations with Farrakhan, or anything else negative for that matter – can just shut the hell up. One is assumed racist when delivering criticism about Obama because any criticism of Obama is just veiled racism in their eyes. When it comes to a great big Lack O’ Fact, you don’t get much better than Barack Obama. He’s green. He’s new. He hardly has a record. While some laud this as one of his greatest characteristics (ie, “He’s certified Lobbyist-Free,” or “He’ll shake up DC” or “no baggage here“) it still remains an inconvenient fact that there are precious few facts. On most of the important issues, all we have are his words or spoken intentions. Maybe we have some words on a website. Now, I’m not saying his word isn’t good – in fact, I have no earthly idea if it is or not. This is the void I was talking about earlier. Put another way – how can someone logically be against something they know nothing about? Obama’s actual record (OMG! HE HAS A RECORD!?!?!) doesn’t look too good for the future of the Second Amendment. He supports local gun bans (like in DC and Chicago) even for uses of self-defense. You can view a current-running political ad regarding Obama’s dismal 2nd Amendment record. He supports federal laws overriding a State’s granting of a concealed carry permit. He opposed Illinois State SB 2165, which would have protected the right of self-defense. It seems he won’t state his position until it’s too late. The intentional omission of one’s stance for political wagering warrants significant suspicion in my book. He served on the board of the agressively anti-gun Joyce Foundation (whoa, $2.7 million in anti-gun grants? *that’s* a record). The more I read Obama’s statements and responses to these facts, the more it smacks of waffling. I’m definitely a fan of waffles, pancakes and eggo’s, but Leggo My GUNNO. I can understand the strategic advantage in not giving your opponent enough information to nail you to the wall, but we are talking about our government here, not a celebrity. People want to fit things into where it makes sense in their minds. If all they have is a hammer, then everything looks like a nail. I suspect that out of the three remaining candidates, McCain, Hillary and Obama, the latter is the only one they *can* choose, by their definitions. I gather that most Obama supporters would automatically “disqualify” Hillary and McCain whether Obama was running or not. For them, Obama gets their nod simply by process of elimination. And now that Hillary is “out” based on the DNC, it becomes even easier. When combined with the “people are optimistic” claim above, voters hear things like “McCain is Bush revisited” and “Can we afford another Clinton scandal“, and “McCain is older than the flag,” they figure two of their three options are gone, so the last one HAS to be a good one. And when you add in the “Obama is *really* blank” piece, they have nothing to tell them otherwise. So they continue with the notion that he’s the horse to bet on. In their minds, he can deliver them goodness. In their minds, he can make Bush go away, and everything will just get better. In their minds, Obama *is* the candidate of change, and change can only be good. In their minds, they are concocting enough reasons to believe. In their minds, Obama fills in the blanks they can’t fill for themselves. Did you say “black slate”? That was very informative. and well written, I think…. Cissa Firehearts last blog post..
I’m nervous about Obama now that I’m kind of realizing not only that he probably can’t get elected but that if he does he’ll probably raise the taxes. Even though you have posted links to confirming articles on Obama’s lack of supporting the 2nd Amendment, I don’t think it’s as dire as people are making it out to be. Granted, I’m not a gun owner and don’t know much past a pellet or BB gun, but I seriously doubt that any of these actions are going to harm the 2nd Amendment in any serious way. Obviously, I’m an Obama supporter and think he has the best change to change things around. Call him blank, black or willing to throw every gun in this country into a giant bon fire, but it really is the better of all the current options, IMO of course. Did I have another candidate in mind? Or yes, there were one or two that I felt had more of my positions, but since they are not running or have suspended their campaigns, I am getting behind the one I feel shares most of my views and positions. And if you want to look at it from a point of “he’s what’s left”, then I guess I’m happy to vote with what’s left. Because for me, it’s better than a third term of same ol’ ball and chain. I think we need a blank slate, and someone who might have a fresh look. We have too many career politicians in there right now, and none of them are doing any good for the country. The fact that he is new doesn’t mean he’s an “anyone but” person, though. He’s charismatic and intelligent, and I don’t think you could just stick anyone in there and get the passion and interest that he has been getting. And since I do agree with most of his established record of voting so far, I’d actually be voting for HIM, not for an Alternative To The Other Candidates. Oh I’m definitely supporting Obama. First, I agree with what Avitable said. The “blankness” isn’t an issue for me. If you look at his voting record, yes it can be similar to Clinton’s. However, if you look at everything new they’ve tried to introduce, they’re similar, but you have to look at who else backs them. Obama regurarly had lots of supporters where Clinton would have very few. He’s a leader, where she was just getting her name in there. I did, however, vote for John Kerry because he was not George Bush. George W. Bush was a failure at every job he ever had, especially his current one, but the American public made him a two-term president. Track record has nothing to do with getting elected. It’s all about who does the best job swaying the idiots in the middle –who know nothing about where any of the candidates stand on the issues — with smoke and mirrors. Since you’re going to slam me in private, I thought I’d elaborate here instead. The first job he ever had was running an oil business into the ground, resulting in bankruptcy. The Texas Rangers weren’t successful under his leadership. I don’t know anything about his “success” as the governor of Texas, but his immense failure as president of these United States is surely enough to trump any good he did there. Throw in his cocaine/alcohol abuse/addictions and skipping out on the National Guard and you’ve got some horse there. His “down-home charm” got him elected, not his credentials. That’s the point I was trying to make. You say things a lot of us just think. Good job. My next blog is not only about his abortion stance but his recent remarks that if he were elected he would tell corporations how to invest their money. He wants them to invest in clean air projects. 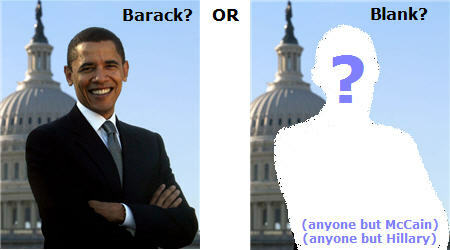 Out of the “other options” I think Obama is the worst canidate. Just because a President is “charismatic” does not mean they know how to run a country. I don’t think a canidate who thinks they can stop terrorism by having tea with a leader is “intelligent” either. ajooja- If we are going to go based on backgrounds then I am assuming you are anti Obama as well? I compared the two as ajooja felt it was appropriate to do so. Please read above to see what I was referring to. Ajooja pulled a lefty and decided to talk about another canidate when the focus was about Obama. They decided to mention Bush’s PAST history. If we are going to talk about drug use then let us talk about Obama’s drug use. If he is anti Bush for things like that he must also be anti Obama. Whall- I just made a post about how he believes that babies who survive abortion should not be given equal medical treatment as those who are wanted even though they are outside of the womb. This alongside his support of anti second amendment laws, support of the GPA, and corporation regulation point to nothing new…just the same old extreme leftism/communist ideas that like to ignore our constitution. I am so proud of my daughter. 🙂 Great post, Whall. You know how I feel on the subject. Amanda.. fair enough response. But my post wasn’t referring to drug use, it was on how this country has been run and basing it on… oh screw it. why debate it. it will simply be words that fall on deaf ears. Vote McCain and we’ll talk in 3 years. Amanda, Wayne mentioned Obama’s track record. My point was that Obama’s track record can’t be any worse than Bush. I’m sorry if you don’t understand. You and Wayne are obviously biased too so it makes no sense to get into it with either of you. marty- lol…well let me say that I do not believe Mccain is “another Bush” I am not pro Bush btw. ajooja- Being biased does not mean one cannot debate well. You are certainly biased, however, I know you would be debate worthy. ajooja, I’d argue that what got Bush elected was as much the poor quality of the opponents as his “down-home charm”. Mr. Fab, why you gotta bring race into it? Cissa Fireheart, I appreciate the note! Robin, not so sound alarmist, but RUN! RUN! RUN! HE *WILL* RAISE TAXES HE PROMISED HE WOULD. martymankins, Glad to hear your opinion. Re “direness”, the NRA has made plenty of cases why this should be seen as a dire situation. And it’s not that I posted links about his lack of support – they are links about his attacks on the 2nd amendment. He is proactive in his gunning down of our rights (pun intended). Avi, you know, I’m also very eager and supportive of the fresh look/blank slate piece. I didn’t mean to imply that his newness did not have advantages, and I agree with those advantages. His support for the Oath of Presidential Transparency, for example, is quite refreshing and I’m standing up and yelling HELLS YEAH! I know I heard somewhere that he was discussing backing out of the oath, but I can find no evidence of that article. I do hope (yes, I have hope!) that if he gets elected he at least stays true to that Oath he signed. (btw, part of his small record includes sponsoring a bill similar to this oath, another good thing in his favor). Dave2, I like how you combined a statement AND a question with your comment. Thank goodness for CommentLuv! Amanda, so you’re another American with ABB Syndrome – ABBA – Anyone But Bush American. Well, that’s the name of the game, Chiquitita. ajooja, you know, my living room could use some painting. It’s a really large room. Maybe I could borrow some of your broad brushes? You make a good point (although veiled in sarcastic pessimism) that you have one big bunch of reds, a big bunch of blues, and then this 20% in the middle that might go one way or the other – and who does the party choose to try to sway? Like Perot’s influence for example. sue, hey, that’s what I made the blog for! yay! amanda, let me guess – you’re Republican, right? I’m also against the gov’t stepping into corporate policies such that they instruct rather than incent. martymankins#2, I guess we’ll have to respectfully disagree on whether America has been run into the ground, or that a President single-handedly can be responsible for it. BlondeBlogger, thanx. both for the daughter and for the comments! martymankins#3, I know you were directing your response to Amanda, but speaking for myself, I do not have deaf ears and I do encourage the voicing of opinions you have. All I ask is for civil discourse. and a stimulus check. And more of the paycheck I earn. ajooja, I really don’t think I’m biased. bias implies unfairness or preventing an objecting point of view from being considered. What have I said that shows I’m being unfair? Disagreement should not automatically equal bias. amanda#3, amen to the pro-Bush comment. and also good point about debating but still I think the both of you are misunderstanding the meaning of bias. Just like many people misunderstand (and are subsequently afraid of) the term “discriminating.” It’s *good* to be discriminating or to discriminate. It’s *bad* to unfairly discriminate. Ren, while I can easily agree with the word “quality” as used in the sentence, it might be more fair (ie, less biased0 if you used “strategy” For the pro-Bush people, I mean strategery. I’ve taken the liberty of doing some research based on the links you posted above. While I can see how the various links paint Obama as someone who is attacking the 2nd Amendment, the only way to override an amendment is to get more than 2/3 support from each state. That would be 37 states. I seriously doubt that a single elected person can dictate to 37 states to repeal a constitutional amendment. that Obama is more interested in trying to curb violence than take away guns from law-abiding citizens. The YouTube video you linked to is part of the above linked article. I know we agree to disagree on this, but this smells a bit like “swift boating” to me. Still waiting for my stimulus check. Promised on May 16th (per IRS letter I received) and all calls to the IRS to find out where it’s at all end with “We are experiencing high call volume at this time. Please try your call again later.” I’ve got an economy to save! martymankins, you are correct – a single elected person cannot dictate to 37 states to repeal an amendment. But a single elected person can VETO. We already have a democratic congress. I’m not suggesting that Obama can do it all himself, but his wording is so crafty – “I think people have the right to lawfully bear arms” – he added “lawfully” and I fear he did it on purpose. Why not just say “right to bear arms?” His addition leaves open the possibility of interpretation of new laws that further constrict our natural rights. If we would just enforce the laws we already have, we’d get a safer society. “swift boating” implies an attack that is unfair or untrue – I still see nothing untrue in what I’m saying. I’m not putting words in Obama’s mouth. As far as I know, I’m only speaking the truth here. We get from this that he believes the Constitution confers an individual right. We do not get from this that he supports the right. See the wording? Notice how the answer says “there are several answers that didn’t reflect his views” but DOES NOT MENTION AT ALL that any of the incorrectly answered questions have to do with guns. A: I don’t think that we can get that done. He’s stating that he doesn’t think he can get it done – the act of licensing and registering gun owners. He does NOT say that he would not do it or that he’s against it. We got our stimulus check deposited before we got the letter. I hope they see the impact made by new gun purchases. That is, before Obama pushes through the “1 gun per month” bill he co-sponsored in 2000.
whall – I see the interpretation of his words and how they can inject concern about his support for the 2nd Amendment. And you make a good point about how a single person can VETO, but is your concern that he wouldn’t veto something that passed the house and the senate? Even still, passing an changes to an amendment takes a lot. I mean, look at Bush and his push for a constitutional amendment banning gay marriage. He had a lot of the religious right and both a Republican house and senate behind him and they still couldn’t muster up enough votes to take it to the next level (thankfully, IMO). I see your concern, especially with previous documents and what not that has been discovered, but I still say any changes he may make still have to go through the entire process. It’s not just him, even with veto power or not. A lot can change once someone gets into office, regardless of their previous support for issues. By what you’ve expressed, that should be a non-issue since one president can’t make a difference. I tend to disagree and I think a lot can be done policy-wise to take away our right to own guns. Obama will also be responsible for selecting judges and he would obviously choose those who agree with his beliefs. I think this is a very real concern for those of us who want this amendment protected. BB – good thing for everyone that amending the constitution is a difficult and labored process. Yes, amending the constitution is difficult. Implementing policies that chip away at our rights is not that hard, however. Nor is it hard to elect judges that will vote in favor of those policies. lol. Nice facts. Just like what I am looking for.